9th February 2019. In his 97th yr. Peacefully at Blair House Nursing Home, Newtownards. Formerly of Ashley Avenue, Belfast. Dearly loved husband of Esther and devoted father of Betty, Peter and Roy. Service in Grace Free Presbyterian Church, Newtownards on Wednesday at 1.00pm Funeral afterwards to Movilla Cemetery. Family flowers only please. 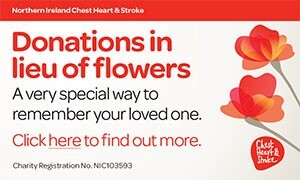 Donations may be sent if desired to the Alzheimers Society c/o S. Clarke & Son Funeral Directors, 12 Court Square, Newtownards, BT23 7NY. Sadly missed and lovingly remembered by the entire family circle. The Officers and Members of Symington Memorial Silver Band wish to express their deepest sympathies to esteemed member Peter on the death of his father and also to the family circle. God has you in his keeping, we have you in our hearts. Dearly missed by daughter Betty, son-in-law Henry and granddaughter Michelle. I am sorry to tell you that Thomas (Tom) MARTIN has passed away.